Please Join us April 14, Sunday Evening, 6:00 to 9:00 p.m. MSG Moellers' Single Adult Gathering, Fuddruckers Restaurant, Golf Road, Schaumburg, IL, Meal, What About It, Bob? Q and A, and Mingle. Take our brand new free inventory quiz here online from our Six Hearts of Intimacy book! 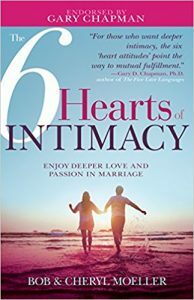 Listen to Six Hearts of Intimacy with Dr. Gary Chapman and Bob and Cheryl Moeller ​If you want greater passion in your marriage, don’t miss Building Relationships with Dr. Gary Chapman. Gary welcomes authors and speakers Bob and Cheryl Moeller who reveal the six hearts of sexual intimacy. Couples who uncover the counterfeit hearts are able to find a deeper intimate… Read the full article. When: Saturday, March 30, 8:30 a.m. Registration, 9:00 a.m. – 4:00 p.m. Sessions “Baby Steps to the Building Blocks of Writing” 9:00 a.m. Cheryl – Welcome and Introduction “My heart is stirred by a noble theme as I recite my verses for the king; my tongue is the pen of a skillful writer.” Psalm 45:1 “The… Read the full article. Sadly, couples can spend most of their married life feeling distant and unfulfilled. Even if they pursue counseling for their marriage they may soon revert back to the old patterns. Why is it that some couples just can’t seem to make progress in their marriage? 1. The commitment to the marriage may be unequal; one… Read the full article. Free help for your relationship.